When Torn first premiered at the Arcola theatre, it sold out in the first two weeks. 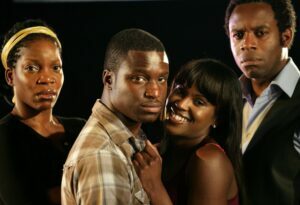 Back with a new cast and creative team, Torn explores the African Caribbean divide. Femi Oguns explains why its refreshing theatre keeps exploring sensitive subject matters of this nature. Torn is a modern day version of Romeo and Juliet, told through the lens of the cultural divide and tensions in the Black British community. David and Natasha are lovers, one is African and the other is Jamaican. Together they are building a life which is soon threatened by their family’s opposition to their cross-cultural relationship. Oguns believes these issues have to be addressed to the point where we can acknowledge that we are one as a people rather than dividing ourselves into sub-cultures groups. “We are black, full stop. So, I think these issues have to be addressed in a way that educates us and reaffirms that we are one as a people,” he says. This entry was posted on Tuesday, June 8th, 2010 at 3:56 am	and is filed under Features, Interviews, Journalism, Marriage & Relationships, Musings, Nigeria, Theatre Interviews. You can follow any responses to this entry through the RSS 2.0 feed. You can leave a response, or trackback from your own site.